Oct 3rd - Fired 39 Rounds on Hostile Battery in N 21 c 90.18 and 18 Rounds on Hostile Battery in N 20 a 52.45 and at 5.5.PM. fired 9 Rounds retaliation on M(? )ericourt sector. R. J. Waterous left Battery for England to attend course. 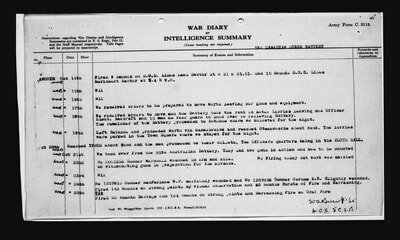 Oct 9th - Fired 35 Rounds on Hostile Batteries at N X 44, N X 43 and N Z 98. 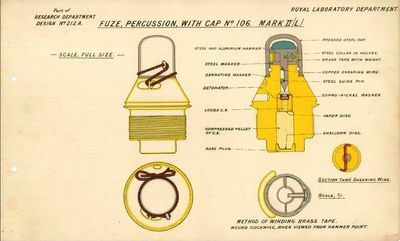 No 91880 Gunner Burgess A was accidently killed by a small explosion from a 106 Fuse. 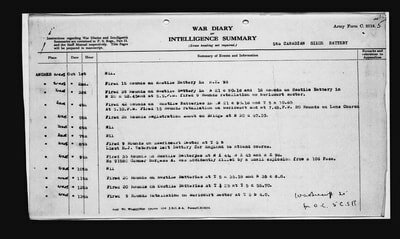 Oct 11th - Fired 20 Rounds on Hostile Batteries at T 5 a 35.18 and N 35 c 8.8. Oct 12th - Fired 20 Rounds on Hostile Batteries at T 25 at T 5 d 55.70. Oct 14th - Fired 9 Rounds on S.O.S Lines Lens Sector at R(?) 21 a 25.51. and 15 Rounds S.O.S. Lines M(? )ericourt Sector at ?.4 b 9.8. 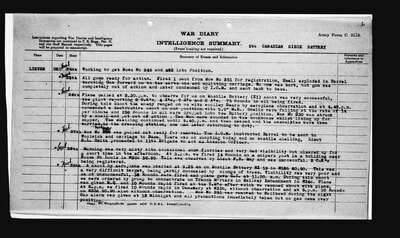 Oct 17th - We received orders to be prepared to move North leaving our guns and equipment. 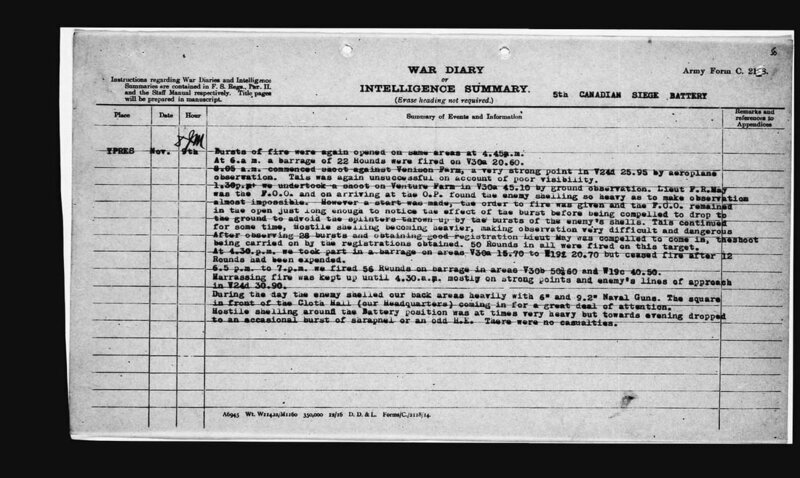 Oct 18th - We received orders to move and the battery took the road in Motor Lorries leaving one Officer Lieut. Beecroft and 10 men as rear guard to hand over to relieving Battery. The remainder of the Battery proceeded to Bethune where we billeted for the night. Oct 19th - Left Bethune and proceeded North via Hazelbruick and reached Steenvoorde about dusk. The lorries were parked in the Town Square where we stayed for the night. 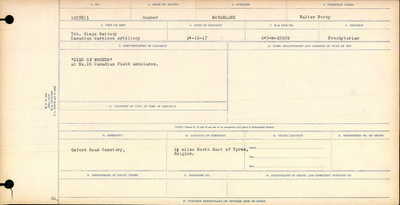 Oct 20th - reached YPRES about noon and the men proceeded to their billets. The Officers quarters being in the CLOTH HALL. Oct 21st - We took over from the 55th Australian Battery. They had two guns in action and one to be mounted. Oct 22nd - No 2001258 Gunner Marshall wounded in arm and side. No Firing today but work was carried on with mounting guns in preparation for the advance. 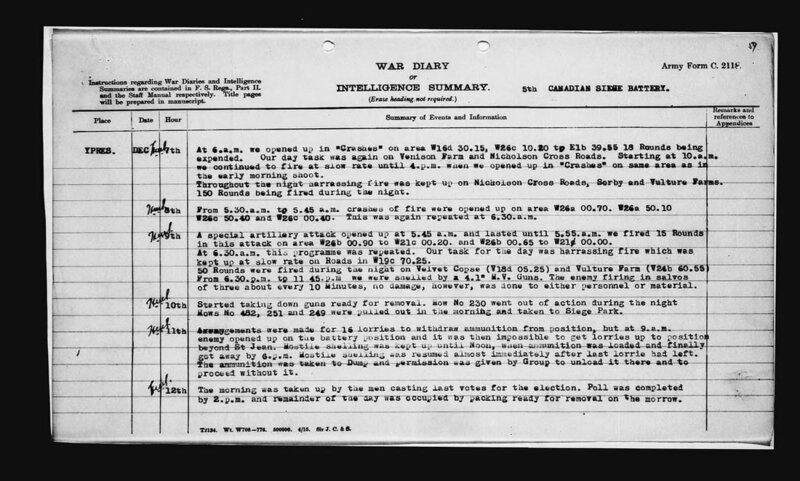 Oct 24th - No 1257815 Gunner MacFarlane W. P. Seriously wounded and No 1257868 Gunner Gorham E. R. Slightly wounded. 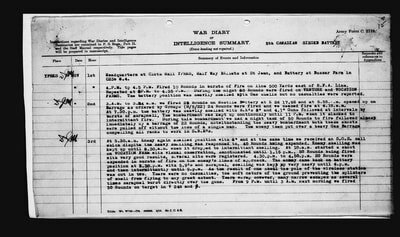 Fired 143 rounds on strong points by visual observation and 48 Rounds Bursts of Fire and Harassing. Oct 26th - Got guns into action for the advance of today but gun went out of action before the end of the day and had to be pulled out and put back on new line. Fired 298 Rounds attack barrage and 31 Rounds protective barrage on Battery lanes. ​During the evening we fired 12 Rounds, bursts of Fire and during the dark hours fired 50 Rounds on Valour Farm. 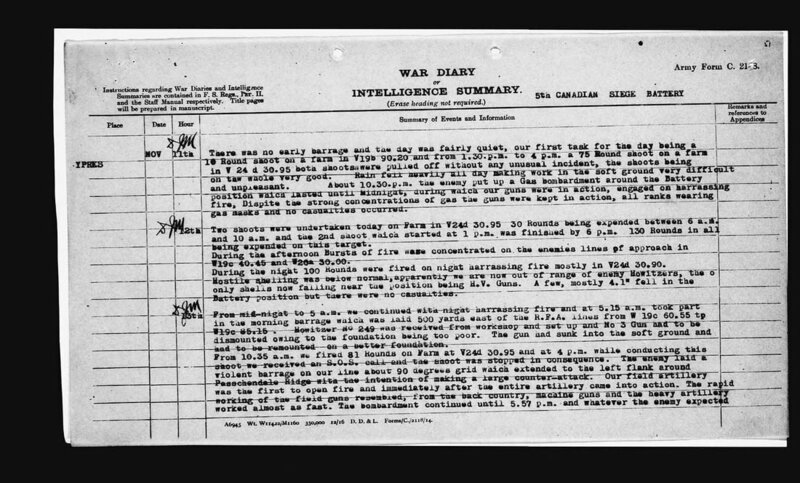 Oct 27th - Fired ?2 Rounds Barrage on Battery lanes and 54 Rounds on a Pill Box at V 29 d 30.60 by Aeroplane observation. During the afternoon fired 12 Rounds as Bursts of Fire on Valour Farm and D.5 Central. At 3.15P.M. we fired 20 Rounds barrage on Battery Lanes. During the night Bursts of fire were kept up and 38 Rounds expended. 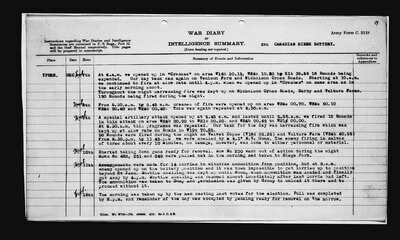 Oct 28th - No 92919 Gunner Saerran G. E. wounded in the leg. Major T.W.F. MacDonald was admitted to hospital leaving Lieut. DJ. Maxwell in command of the Battery. Oct 29th - Lieut Fraser R. A. who had been sent to England to raise new section for two extra guns rejoined unit bringing Lieut E. Scott and 70 Other Ranks. 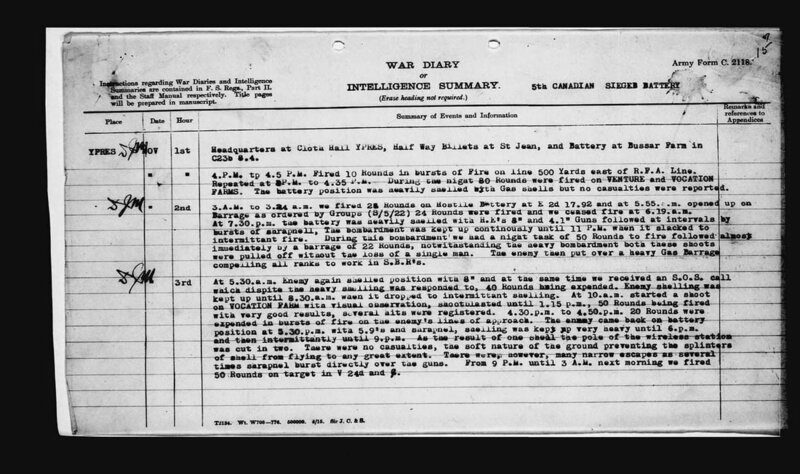 Fired 35 Rounds Barrage in Battery Lanes, and during the night 30 Rounds on Valour and Vegetable Farms. Fired 45 Rounds by visual observation on Vanity House and Vine Cottage, 50 Rounds were then fired by Map on Vapour (Valour?) Farm and 45 Rounds on Vocation Farm. During the afternoon 287 Rounds were fired on Barrage and 46 on S.O.S. Oct 31st - At 5 A.M. 25 Rounds were fired on barrage and 10 on S.O.S. lines. At 1.45P.M. a shoot was commenced on Valour Farm by Aeroplane observation but Plane gave C.I. after 2 rounds had been fired. Bursts of fire were kept up during the afternoon and 20 rounds fired on S.O.S. lines. Nov 1st - Headquarters at Cloth Hall YPRES, Half Way Billets at St Jean, and Battery at Bussar Farm in C23b 3.4. 4.P.M. tp 4.5 P.M. Fired 10 Rounds in bursts of Fire on line 500 Yards east of R.F.A. Line. Repeated at (?)P.M. to 4.35 P. M. During the night 30 Rounds were fired on VENTURE and VOCATION FARMS. The battery position was heavily shelled with Gas shells but no casualties were reported. Nov 2nd - 3.A.M. to 3.24 a.m. we fired 2? Rounds on Hostile Battery at E 2d 17.92 and at 5.55. a.m. opened up on Barrage as ordered by Groups (S/5/22) 24 Rounds were fired and we ceased fire at 6.19.a.m. At 7.30.p.m. 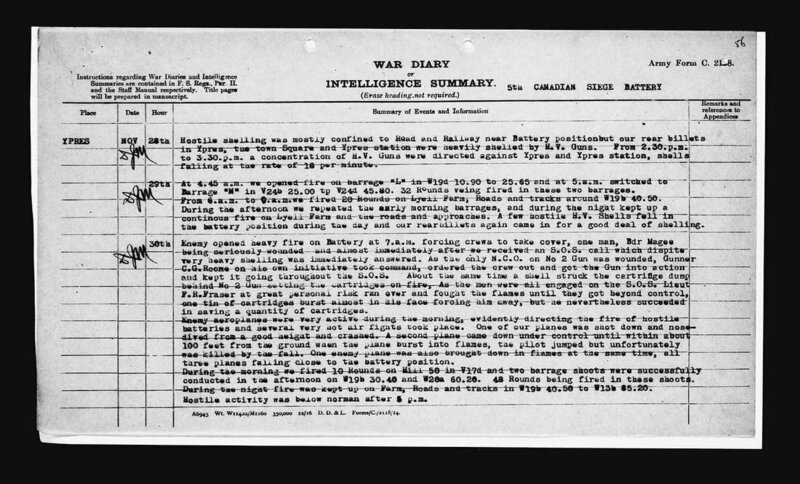 the battery was heavily shelled with H.E.’s 3” and 4.1” Guns followed at intervals by bursts of shrapnel. The bombardment was kept up continuously until 11 P.M. when it slacked to intermittent fire. During this bombardment we had a night task of 50 Rounds to fire followed almost immediately by a barrage of 22 Rounds, nothwithstanding the heavy bombardment both these shots were pulled off without the loss of a single man. The enemy then put over a heavy Gas Barrage compelling all ranks to work in S.B.R’s. Nov 3rd - At 5.30.a.m. Enemy again shelled position with 8” and at the same time we received an S.O.S. call which despite the heavy shelling was responded to, 40 Rounds having expended. Enemy shelling was kept up until 8.30 a.m. when it dropped to intermittent shelling. At 10.a.m. started a shoot on VOCATION FARM with visual observation, shoot lasted until 1.15.p.m., Rounds being fired with very good results, several hits were registered. 4.30.p.m. to 4.50.p.m. 20 Rounds were expended in bursts of fire on the enemy’s lines of approach. The enemy came back on battery position at 5.30.p.m. with 5.9’s and shrapnel, shelling was kept up very heavy until 6.p.m. and then intermittently until 9.p.m. As the result of one shell the pole of the wireless station was cut in two. There were no casualties, the soft nature of the ground preventing the splinters of shell from flying to any great extent. There were, however, many narrow escapes as several times shrapnel burst directly over the guns. From 9 P.M. until 3 A.M. next morning we fired 50 Rounds on target in V 24d and (?). Nov 4th - At 4.40.a.m. we opened up an Barrage as ordered by Group. The Barrage being continued until 5.24.a.m. 75 Rounds were also fired on Hostile Battery at E 2 c 65.65. At 6 a.m. we fired 12 Rounds barrage in Battery lane. 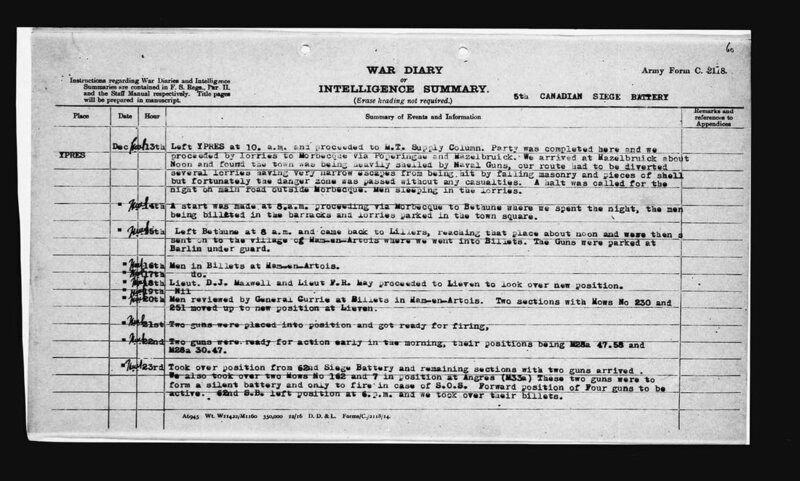 Day was very quiet and we had no special task but during the day fired 55 Rounds in Bursts of fire in Battery Lanes. During the evening we were shelled by 8” and Gas. No damage was done although a large number of shells fell very close to the guns. At 4.50+a.m. we commenced Barrage fire in lanes M and A area V29 b 75.55 to V24d 90.57. 106 Fuse was good entirely in this barrage. 2.30.p.m. we fired on Venture Farm in V30a 45.10. This was a very strong point, originally a farm house into which the enemy had built a reinforced concrete ‘Pillbox” and was a very difficult target. 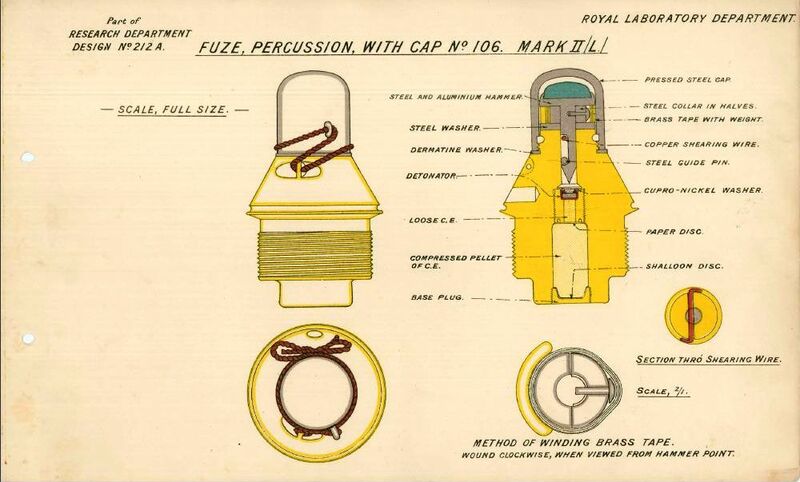 The first 30 Rounds were observed by Lieut H. M. Stairs during which one O.K. was recorded. 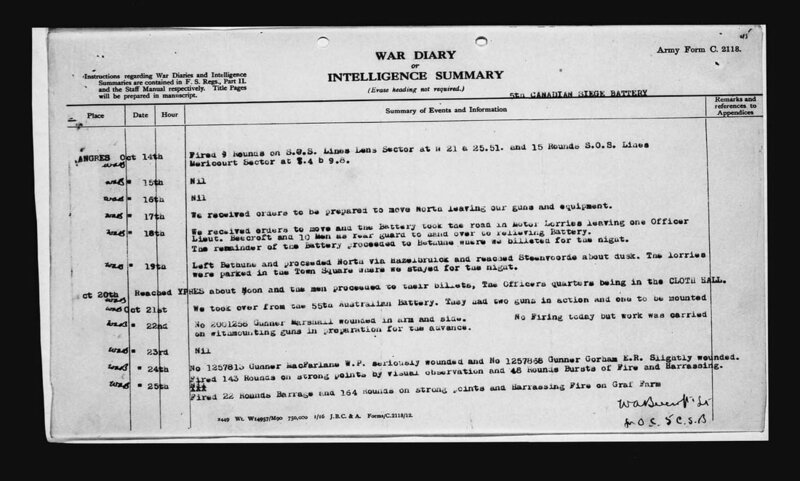 Visibility then became so bad that ground observation had to be abandoned and shoot was finished by registration, 63 Rounds in all being fired. At 9.10.p.m. commenced shoot of 75 Rounds against Virile Farm and Vocation Farm, both very strong points of a similar nature to Venture Farm and situated in areas V29b 80.45 and V30a 07.57 respectively. This shoot was carried out without observation. Hostile shelling during the day was below normal, an occasional shrapnel bursting over the guns. A few 5.9” HE’s dropped in the battery position but these were probably intended for the Road or Railway track which runs closed to the position. At about 6.30.p.m. a dump at Spree farm blew up sending splinters all around battery position but fortunately there were no casualties. During the night the battery was shelled intermittently by a 4.1” Gun, no damage being caused. Nov 6th - This was a very busy day, the guns being in action continuously. In the early morning we took part in three heavy barrages which were kept up from 6 a.m. until 2.45 p.m. The first of these was directed against Vine farm in V 30a 07.57. expending 44 rounds and lasted until 6.42a.m. when we lifted to Vocation Farm in V30a 07.57. At 7.30p.m we switched to V30b 85.60 and V30b 80.80. this barrage lasted until 2.45pm a total of 244 Rounds having been fired. ​At 9.30.a.m. we took on a strong point in V19c 47.12 other targets during the day being the Cross Roads at W35a 90.90. Whist Farm in W19d 10.90 and the main roads N.E. of Whist Farm. 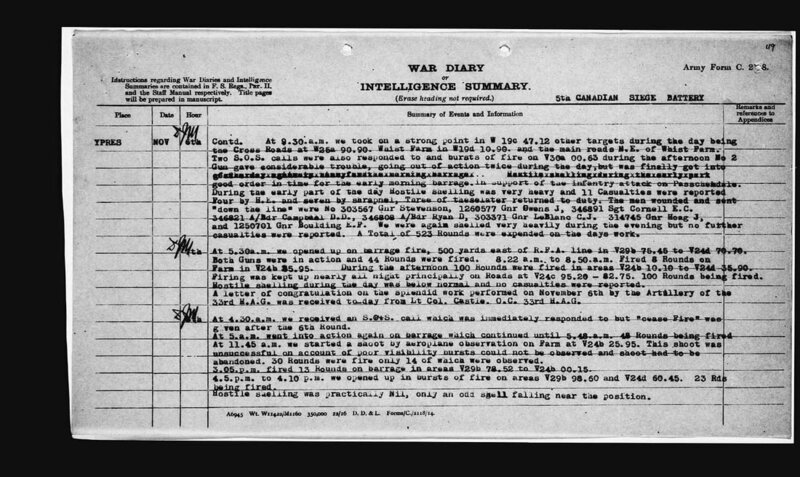 Gun gave considerable trouble, going out of action twice during the day, but was finally got into good order in time for the early morning barrage in support of the infantry attack on Passchendale. During the early part of the day Hostile shelling was very heavy and 11 Casualties were reported Four by H.E. and seven by shrapnel, Three of these later returned to duty. 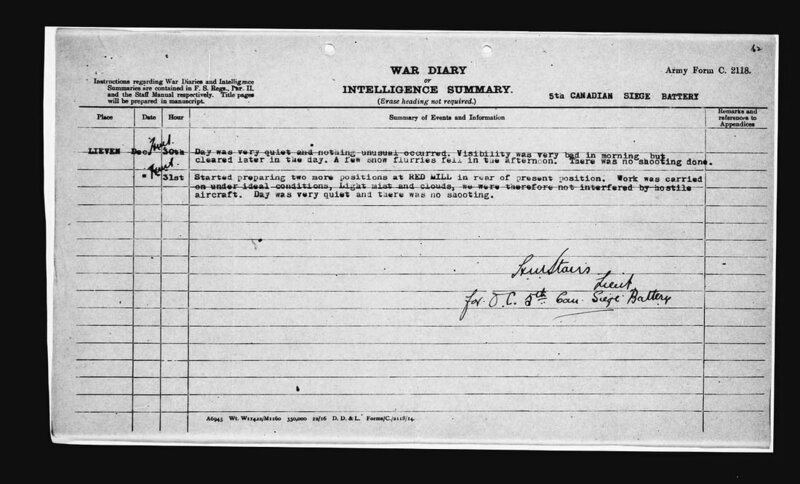 The men wounded and sent ‘down the line’ were no 303567 Gnr Stevenson, 1260577 Gnr Owens J , 346891 Sgt Cornell E. C. 346821 A/Bdr Campbell D. D., 346808 A/Bdr Ryan D, 303371 Gnr LeBlanc C.J. 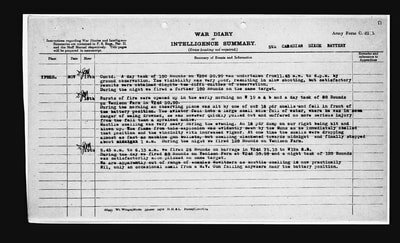 314745 Gnr Hoag J, and 1250701 Gnr Boulding E.F. We were again shelled very heavily during the evening but no further casualties were reported. A Total of 523 Rounds were expended on the days work. Nov 7th - At 5.30a.m. we opened up on barrage fire. 500 yards east of R.F.A. line in V29b 75.45 to V24d 70.70. Both Guns were in action and 44 Rounds were fired. 8.22 a.m. to 8.50 a.m. Fired 8 Rounds on Farm in V24b (?)5.95. During the afternoon 100 Rounds were fired in areas V24b 10.10 top V24d 35.00. Firing was kept up nearly all night principally on Roads at V24c 95.20 – 82.75. 100 Rounds being fired. A letter of congratulation on the splendid work performed on Nov 6th by the Artillery of the 33rd H.A.G. was received to-day from Lt Col. Castle, O.C 33rd W.A.G. Nov 8th - At 4.30.a.m. we received an S.O.S. call which was immediately responded to but “cease fire” was given after the 6th Round. At 5.a.m. went into action again on barrage which continued until 5.48.a.m. 48 Rounds being fired. At 11.45a.m. we started a shoot by aeroplane observation on Farm at V24b 25.95. This shoot was unsuccessful on account of poor visibility. bursts could not be observed and shoot had to be abandoned. 30 Rounds were fired only 14 of which were observed. Hostile shelling was practically Nil, only an odd shell falling near the position. Nov 9th - Bursts of fire were again opened on same areas at 4.45p.m. At 6.a.m. a barrage of 22 Rounds were fired on V30a 20.60. 3.05a.m. commenced shoot against Venison Farm, a very strong point in V24d 25.95 by aeroplane observation. This was again unsuccessful on account of poor visibility. 1.30p.m. we undertook a shoot on Venture Farm in V30a 45.10 by ground observation. Lieut F. R. May was the F.O.O. and on arriving at the O.P. found the enemy shelling so heavy as to make observation almost impossible. However a start was made, the order to fire was given and the F.O.O. remained in the open just long enough to notice the effect of the burst before being compelled to drop to the ground to avoid the splinters thrown up by the bursts of the enemy’s shells. This continued for some time, Hostile shelling becoming heavier, making observation very difficult and dangerous. After observing 28 bursts and obtaining good registration Lieut May was compelled to come in, the shoot being carried out on by the registrations obtained. 50 Rounds in all were fired on this target. At 4.30p.m. we took part in a barrage on areas V30b 50.60 and W19c 40.50. but ceased fire after 12 Rounds had been expended. 6.5 p.m. to 7.p.m. we fired 56 Rounds on barrage in areas V30b 50.60 and W19c 40.50. Harassing fire was kept up until 4.30a.m. mostly on strong points and enemy’s lines of approach in V24d 30.90. During the day the enemy shelled our back areas heavily with 6” and 9.2” Naval Guns. The square in front of the Cloth Hall (our Headquarters) coming in for a great deal of attention. Hostile shelling around the Battery position was at times very heavy but towards evening dropped to an occasional burst of shrapnel or an odd H.E. There were no casualties. 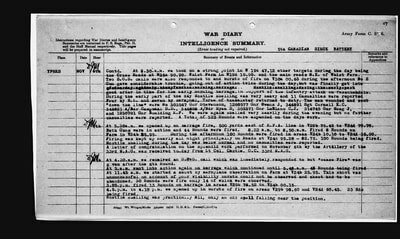 Nov 11th - There was no early barrage and the day was fairly quiet, our first task for the day being a 10 Round shoot on a farm in V19b 90.20 from 1.30p.m. to 4p.m. a 75 Round shoot on a farm in V24 d 30.95 both shoots were pulled off without any unusual incident, the shoots being on the whole very good. Rain fell heavily all day making work in the soft ground very difficult and unpleasant. About 10.30p.m. 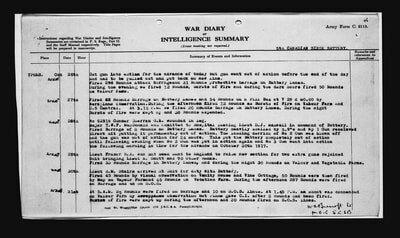 the enemy put up a Gas bombardment around the Battery position which lasted until Midnight, during which our guns were in action, engaged on harassing fire, Dispite the strong concentrations of gas the guns were kept in action, all ranks wearing gas masks and no casualties and no casualties occurred. Nov 12th - Two shoots were undertaken today on Farm in V24d 30.98 30 Rounds being expended between 6 a.m. and 10 a.m. and the 2nd shoot which started at 1 p.m. was finished by 6 p.m. 130 Rounds in all being expended on this target. During the night 100 Rounds were fired on night harassing fire mostly in V24d 30.90. Hostile shelling was below normal, apparently we are now out of range of enemy Howitzers, the only shells now falling near the position being H.V. Guns. A few, mostly 4.1” fall in the Battery position but there were no casualties. Nov 13th - From mid-night to 5a.m. we continued with night harassing fire and at 5.15a.m. took part in the morning barrage which was laid 500 yards east of the R.F.A. lines from W19c 60.55 to W19c 95.15. Howitzer No 249 was received from workshop and set up and No 3 gun had to be dismounted owing to the foundation being too poor. The gun had sunk into the soft ground and had to be remounted on a better foundation. From 10.35a.m. we fired all Rounds on Farm at V24d 30.95 and at 4p.m. while conducting this shoot we received an S.O.S. call and the shoot was stopped in consequence. The enemy laid a violent barrage on our line about 90 degrees grid which extended to the left flank around Passchendale Ridge with the intention of making a large counter-attack. Our field artillery was the first to open fire and immediately after the entire artillery came into action. The rapid working of the field guns resembled, from the back country, machine guns and the heavy artillery worked almost as fast. The bombardment continued until 5.57 p.m. and whatever the enemy expected to gain in ground his losses in men must have been considerable. 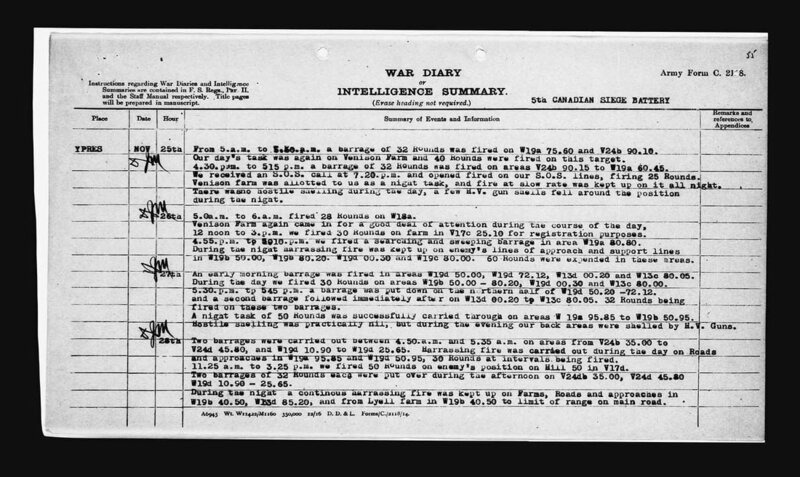 A message received later stated that the enemy counter-attack had failed and the message added that the artillery takes the credit for having responded so quickly. Are lines after this attack remained intact. During the night 100 Rounds were fired on Farm and roads in V24d 30.95. Nov 14th - At 6.a.m. we took part in the early morning barrage. Out target being V24b 70.20 to V13d 00.10 Barrage finished at 6.42 a.m. 42 Rounds having been fired. During the morning bursts of fire were opened on 2W19a 15.25 to W19B 00.35, 100 Rounds being fired. .
At 7.25.p.m. we received an S.O.S. call and went into action on W19A 15.25. This was finished at 7.40.P.M. and we then turned to the night task of 200 Rounds on Farm in V24d 30.95. This was not completed before we had to take part in the morning barrage, only 150 Rounds having been expended. Hostile shelling was very heavy at times, reaching its limit at 7.p.m. but during the night only an occasional shell fell anywhere near the battery position. ​Nov 15th - Day was very quiet and nothing unusual occurred. At 6.10.a.m. We fired 20 rounds barrage on V24d 60.95 and V19a 90.55. Howitzer No 482 was mounted and got into action. Nov 16th - At 6.30 a.m. we opened up on the usual morning barrage which consisted of 46 Rounds and lasted until 7.35 a.m.
Nearly the whole of the day was taken up by a shoot on Venison Farm in V24d 30.90, 150 Rounds were fired and the shoot finished at 6.p.m. At 6.58 p.m. we received an S.O.S. call and fired 23 Rounds on V24b 90.15. This was again repeated at 75p.m. and a further 23 Rounds were put over. During the night 100 Rounds were fired into Venison Farm at V24d 30.90. The day was very quiet as regards hostile shelling. Very few shells fell near the Battery position. Nov 17th - Bursts of fire were put over from 5.55p.m. on enemy’s lines of approach and forward areas. A day task of 100 Rounds on V59d 30.90 was undertaken from 11.45 a.m. to 6. p.m. by ground observation. The visibility was very poor, resulting in slow shooting, but satisfactory results were obtained dispite the difficulties of observation. During the night we fired a further 100 Rounds on the same target. Nov 18th - Bursts of fire were opened up in the early morning on W19 a & b and a day task of 30 Rounds on Venison Farm in V24d 30.90. During the morning an observing plane was hit by some of our 18 pdr shells and fell in front of the battery position. The aviator fell into a large shell hole full of water, where he was in some danger of being drowned, he was however quickly pulled out and suffered no more serious injury from the fall than a sprained ankle. Hostile shelling was very heavy during the evening. An 18 pdr dump on our right being hit and blown up. The flame from this explosion was evidently seen by the Huns as he immediately shelled that position and the vicinity with increased vigour. At one time the shells were dropping almost as fast as machine gun bullets, but shelling slackened towards midnight and finally stopped about 1 a.m. During the night we fired 100 Rounds on Venison Farm. During the day we fired 30 Rounds on Venison Farm at V24d 30.90 and a night task of 120 Rounds was satisfactorily accomplished on same target. We are apparently out of range of enemies Howitzers as hostile shelling is not practically Nil, only an occasion shell from a H.V. Gun falling anywhere near the battery position. Nov 20th - 6.30a.m. to 7.30 a.m. a barrage of 42 Rounds was fired on Farms at V19b 35.75 to W13d 3.0. We again occupied nearly all day in shooting up Venison Farm (V24d 30.90) but the task was interrupted at 4.30p.m. by an S.O.S. call, we put over 56 rounds on our S.O.S. lines in V19a 00.10. and V24b 90.15. Cease fire was given at 5.p.m. and we resumed our task on Venison Farm which was continued throughout the night. 200 Rounds in all were put over on this target. Nov 21st - At 10a.m. we recommenced firing on Venison Farm, 80 Rounds being fired on this target during the day. At 4.30p.m. barrage was opened up on enemy’s lines of approach and communications. We fired 60 Rounds in this barrage on Farms in V18c 80.95 and huts and strong points in V18d 20.30. During the night 60 Rounds were fired on Venison Farm. There was no hostile shelling during the day, everything being perfectly quiet. Nov 22nd - During the day 30 Rounds were fired at Venison Farm, 20 of which were for registration purposes. This was carried out by visual observation and satisfactory results obtained. 4.30p.m. we fired 20 Rounds concentration shoot on areas W18c 80.90 and W18d 20.80. 60 Rounds were fired on Venison Farm during the evening. Nov 23rd - At 3.a.m. received an S.O.S. call and fired 10 Rounds on W19b 35.75, followed almost immediately by a barrage of 42 Rounds on areas W19b 35.75 and W13d 3.0. At 5.30a.m. another S.O.S. call was received and 50 Rounds fired on W19b 35.75. From 11.30a.m. to 2.50p.m. we fired 38 Rounds on Venison Farm, this shoot was continued at 4.45p.m. a total of 60 Rounds being fired. During the night we again kept up fire at slow rate in and around Venison Farm. 11a.m. to 6.0p.m. 40 Rounds were fired on Venison Farm in V24d 30.90 and a further barrage on W19d 10.90. 3.45p.m. to 7.45p.m. 64 Rounds were fired on Forward areas, and lines of approach. 28 Rounds were fired during the night on Venison Farm. Hostile shelling was practically nil. Nov 25th - From 5.a.m. to 5.40a.m. a barrage of 32 Rounds was fired on W19a 75.60 and V24b 90.10. Our day’s task was again on Venison farm and 40 Rounds were fired on this target. 4.30.p.m. to 5.15p.m. a barrage of 32 Rounds was fired on areas V24b 90.15 to W19a 60.45. We received an S.O.S. call at 7.20p.m. and opened fired on our S.O.S lines, firing 25 Rounds. Venison Farm was allotted to us as a night task, and fire at slow rate was kept up on it all night. There was no hostile shelling during the day, a few H.V. gun shells fell around the position during the night. Venison Farm again came in for a good deal of attention during the course of the day. 12 noon to 3.p.m. we fired 30 Rounds on farm in V17c 25.10 for registration purposes. 4.55p.m. to ??10p.m. We fired a searching and sweeping barrage in area W19a 30.30. 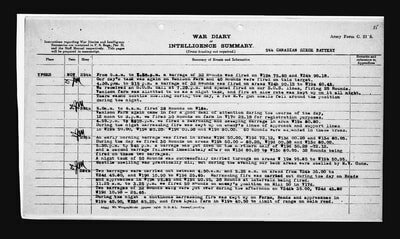 During the night harassing fire was kept up on enemy’s lines of approach and support lines in W19b 50.00, W19b 00.30 and W19c 30.00. 60 Rounds were expended in these areas. Nov 27th - An early morning barrage was fired in areas W19d 50.00, W19d 72.12, W13d 00.20 and W13c 30.05. During the day we fired 30 Rounds on areas W19b 50.00—30.20, W19d 00.30 and W13c 30.00. 5.30p.m. to 5.45p.m. a barrage was put down on the northern half of W19d 50.20—72.12, and a second barrage followed immediately after on W13d 00.20 to W13c 80.05. 32 Rounds being fired on those two barrages. 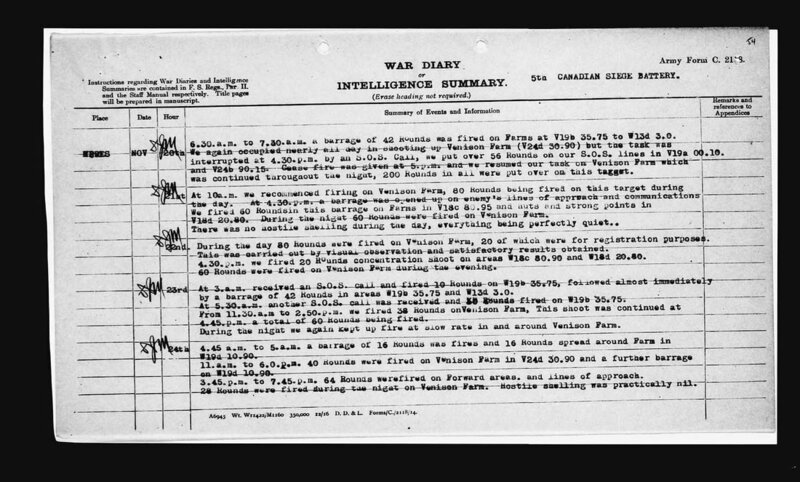 A night task of 50 Rounds was successfully carried through on areas W19a 95.85 to W19b 50.95. Hostile shelling was practically nil, but during the evening our back areas were shelled by H. V. Guns. Nov 28th - Two barrages were carried out between 4.50.a.m. and 5.35a.m. on areas from V24b 35.00 to V24d 45.30 and W19d 10.90 to W19d 25.65. Harrassing fire was carried out during the day on Roads and approaches in W19a 95.35 and W19d 50.95, 30 Rounds at intervals being fired. 11.25a.m. to 3.25p.m. we fired 50 Rounds on enemy’s position on Hill 50 in V17d. Two barrages of 32 Rounds each were put over during the afternoon on V24db 35.00, V24d 45.30 W19d 10.90—25.65. During the night a continuous harassing fire was kept up on Farms, Roads and approaches in W19b 40.50, W13d 85.20, and from Lyell Farm in W19b 40.50 to limit of range on main road. Hostile shelling was mostly confined to Road and Railway near Battery position but our rear billets in Ypres, the town Square and Ypres station were heavily shelled by H.V. Guns. From 2.30p.m. to 3.30p.m. a concentration of H.V. Guns were directed against Ypres and Ypres station, shells falling at the rate of 18 per minute. Nov 29th - At 4.45a.m. we opened fire on barrage “L” in W19d 10.90 to 24.65 and at 5a.m. switched to Barrage “M” in V24b 2500 to V24d 45.30. 32 Rounds being fired in these two barrages. From 6a.m. to 9a.m. we fired 20 Rounds on Lyell Farm, Roads and tracks around W19b 40.50. 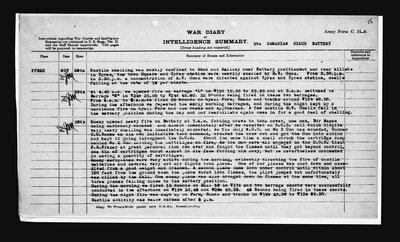 During the afternoon we repeated the early morning barrages, and during the night kept up a continuous fire on Lyell Farm and the roads and approaches. A few hostile H.V. shells fell in the battery position during the day and our rear billets again came in for a good deal of shelling. ​Nov 30th - Enemy opened heavy fire on Battery at 7a.m. forcing crews to take cover, one man Bdr Magee being seriously wounded and almost immediately after we received an S.O.S. call which very heavy shelling was immediately answered. 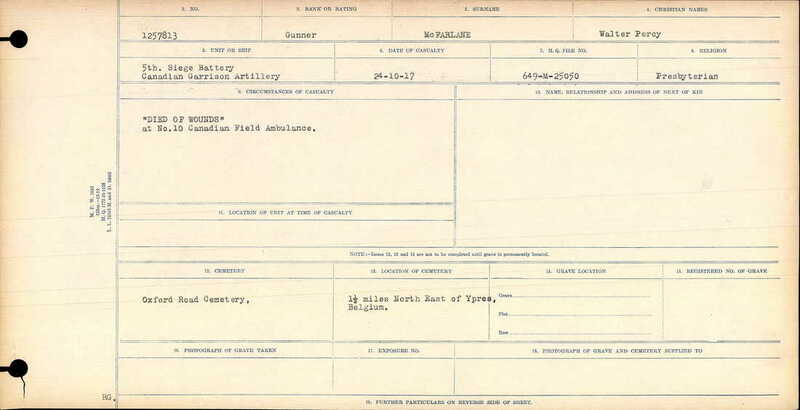 As the only N.C.O on No 2 Gun was wounded, Gunner C.G. Roome on his own initiative took command, ordered the crew out and got the Gun into action and kept it going thoughout the S.O.S. About the same time a shell struck the cartridge dump behind No 2 Gun setting the cartridges on fire. As the men were all engaged on the S.O.S. Lieut F. R. Fraser at great personal risk ran over and fought the flames until they got beyond control, one tin of cartridges burst almost in his face forcing him away, but he nevertheless succeeded in saving a quantity of cartridges. Enemy aeroplanes were very active during the morning, evidently directing the fire of hostile batteries and several very hot air fights took place. One of our planes was shot down and nose-dived from a good height and crashed. A second plane came down under control until within about 100 feet from the ground when the plane burst into flames, the pilot jumped but unfortunately was killed by the fall. One enemy plane was also brought down in flames at the same time, all three planes falling close to the battery position. During the morning we fired 10 Rounds on Hill 50 in V17d and two barrage shoots were successfully conducted in the afternoon on W19b 30.40 and W20a 60.20. 43 Rounds being fired in these shoots. During the night fire we kept up on Farm, Roads and tracks in W19b 40.50 to W13b 35.20. Hostile activity was below normal after 5p.m. Dec 1st - 5.10a.m. to 5.45a.m. we were firing on Barrage in “K” and “M” lanes at qW19d 70.60, V20a 60.20, W19c 50.35 and W198b 30.40. 48 Rounds being expended. During the day we fired at slow rate on Farm and Roads in W19b 40.50 to W13d 35.20. This shoot was still in progress at 4.30p.m. when we were ordered to switch to lane K, 1300 yards east of R.F.A line, 24 Rounds were fired and we then switched to lane “M” 1100 Yards east of R.F.A. lines. A registration shoot was carried out during the afternoon farm in V17c 25.10. Two guns being registered. During the night harassing fire was kept up on Roads in W19b 40.50 and V13d 35.20+ Hostile shelling was normal throughout the day, 9 H.V. shells fell in the battery position but there were no casualties. Dec 2nd - Two heavy barrages were opened up in the early morning, From 2.10a.m. to 6a.m. 250 Rounds were fired on farms in W13d 9020 and W20a 30.50/ After completing these shoots we returned to our night task of harassing fire on Roads and farms in W19b 40.50. We fired 70 Rounds which completed the task and finished at 7.25a.m. We opened fire again at 9.50a.m. on the same target and at 11.10a.m. after having fired 50 Rounds were ordered to cease fire. S.O.S. call was received at 4.15p.m. and opened fire on W19a 60.50 and ceased fire at 4.35p.m. after firing 47 Rounds. During the night we fired 60 Rounds on Farm and Roads in W19b 40.50 and W103d 35.20. 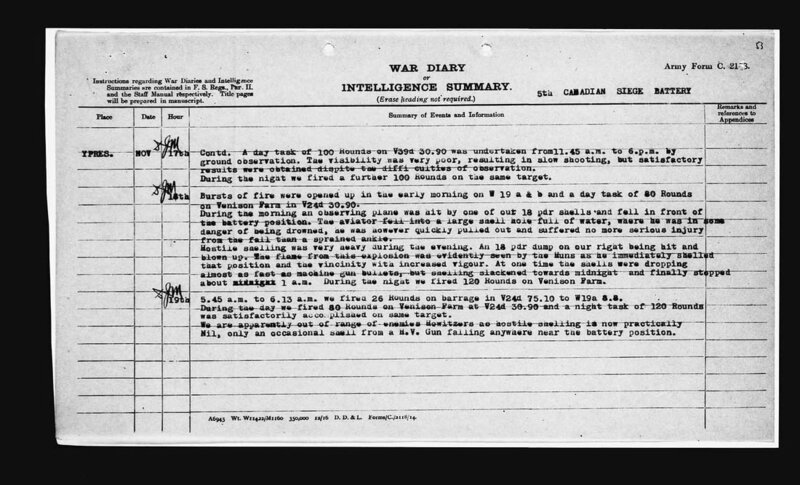 Hostile shelling was below normal but considerable bombing of our rear billets took place during the evening. 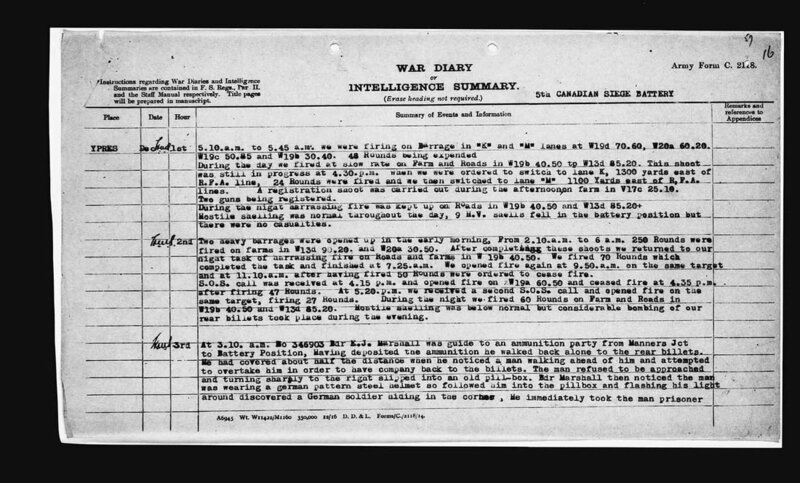 Dec 3rd - At 3.10 a.m. No 346903 Bdr K. J. Marshall was guide to an ammunition party from Mannera Jct to Battery position, Having deposited the ammunition he walked back alone to the rear billets. He had covered about half the distance when he noticed a man walking ahead of him and attempted to overtake him in order to have company back to the billets. The man refused to be approached and turning sharply to the right slipped into an old pill-box. 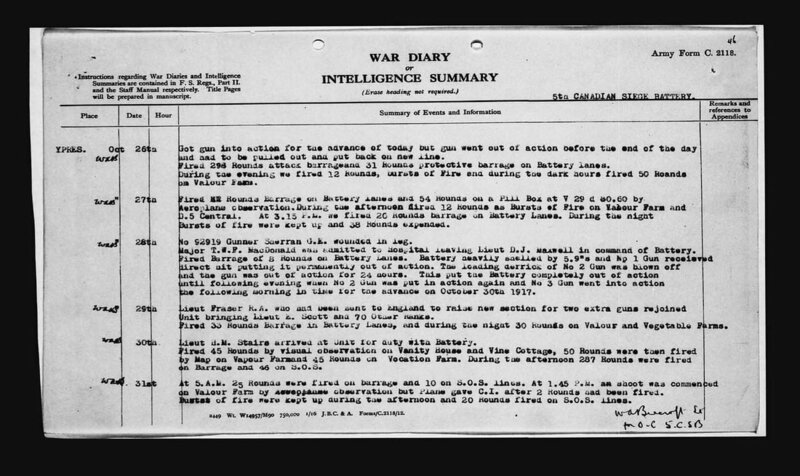 Bdr Marshall then noticed the man was wearing a german pattern steel helmet so followed him into the pillbox and flashing is light around discovered a German soldier hiding in the corner, We immediately took the man prisonerprisoner and marched him back to the Corps Cage, It was then discovered that the prisoner had been wandering around our lines for 5 days with very little food and explained that he was scared to give himself up to the Canadians as his officers had told him that he might expect at our hands if taken prisoner. He was very much surprised and relieved to find conditions so very different to what he had expected. From 6.15a.m. to 7 a.m. we fired in “bursts of fire’ on Roads and Farms in W19b 40.50 and W13d 35.20 36 Rounds being fired. During the day we fired intermittently on McCulloch and Sorby Farms. Hostile shelling was normal throughout the day. A few gas shells and H.V. gun shells fell in and near the Battery position. Dec 4th - At 11a.m. we started voting for the Canadian General Election. Lieut D. J. Maxwell being the presiding officer. Great enthusiasm prevailed amongst the men who were all anxious to poll their votes in favour of the Government. Dec 5th - Received instructions from Group H.Q. that 1st and 2nd Heavy Groups and all Canadian Batteries would shortly be pulling out of the line and to hold ourselves in readiness for pulling out at very short notice. During the day we fired on area McCulloch Farm, Sorby Farm and Nicholson Cross Roads in W13d 90.20, W20a 30.80, and W20a 08.55. The same targets and to 350 yards east were taken for a night task, 85 Rounds being fired. Some hostile shelling of the battery position occurred during the afternoon but never at any time reached large dimensions. Dec 6th - During the day Harrassing fire was carried out on Roads W20a and searching 350 yards east of Nicholson Cross Roads. From 7p.m. and continuing throughout the night Fire was kept up on Venison Farm in V24 30.90. 100 Rounds being expended on the night task. During the evening a Hostile raiding party flew over and bombed our back areas and rear billets in Ypres, one plane became separated and was brought down by A.A. Guns. The pilot discharging his cargo of bombs whilst falling, The machine crashed between Ypres and Poperinghe, the pilot being killed. ​Dec 7th - At 6a.m. we opened up in “Crashes” on area W16d 30.15, W26c 10.20 to E1b 39.55 18 Rounds being expended. Our day task was again on Venison Farm and Nicholson Cross Roads. Starting at 10a.m. we continued to fire at slow rate until 4p.m. when we opened up in “Crashes” on same area as in the early morning shoot. Throughout the night harassing fire was kept up on Nicholson Cross Roads, Sorby and Vulture Farms. 150 Rounds being fired during the night. Dec 8th - From 5.30a.m. to 5.45a.m. crashes of fire were opened up on area w26a 00.70, W26a 50.10, W26c 50.40 and W26c 00.40. This was again repeated at 6.30a.m. 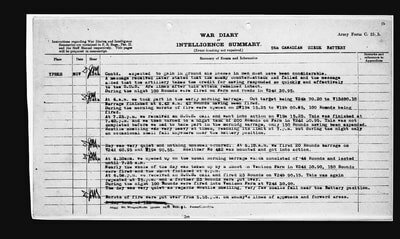 50 Rounds were fired during the night on Velvet Copse (V18d 05.25) and Vulture Farm (V24b 60.55). From 6.30p.m. to 11.45p.m. we were shelled by 4.1” H.V. Guns. The enemy firing in salvos of three about every 10 minutes, no damage, however, was done to either personnel or material. Dec 10th - Started taking down guns ready for removal. Now No 230 went out of action during the night Hows (?) No 482, 251, and 249 were pulled out in the morning and taken to Siege Park. 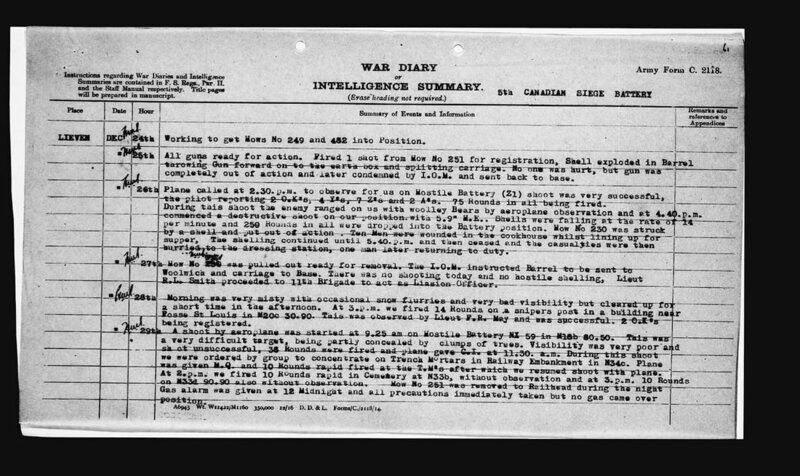 Dec 11th - Arrangements were made for 16 lorries to withdraw ammunition from position, but at 9a.m. enemy opened up on the battery position and it was then impossible to get lorries up to position beyond St Jean. Hostile shelling was kept up until noon, when ammunition was loaded and finally got away by 6p.m. Hostile shelling was resumed almost immediately after last lorrie had left. The ammunition was taken to Dump and permission was given by Group to unload it there and to proceed without it. Dec 12th - The morning was taken up by the men casting last votes for the election. Poll was completed by 2p.m. and the remainder of the day was occupied by packing ready for removal on the morrow. Dec 13th - Left YPRES at 10a.m. and proceeded to M.T. Supply Column. Party was completed here and we proceeded by lorries to Morbecque via Poperingau and Hazelbruick. We arrived at Hazelbruick about Noon and found the town was being heavily shelled by Naval Guns, our route had to be diverted. Several lorries having very narrow escapes from being hit by falling masonry and pieces of shell but fortunately the danger zone was passed without any casualties. A halt was called for the night on main road outside Morbecque. Men sleeping in the lorries. Dec 14th - A start was made at 8a.m. proceeding vie Morbecque to Bethune where we spent the night, the men being billeted in the barracks and lorries parked in the town square. Dec 15th - Left Bethune at 8a.m. and came back to Lillers, reaching that place about noon and were then sent on to the village of Ham-en-Artois where we went into Billets. The Guns were parked at Barlin under guard. Dec 16th - Men in Billets at Ham-en-Artois. 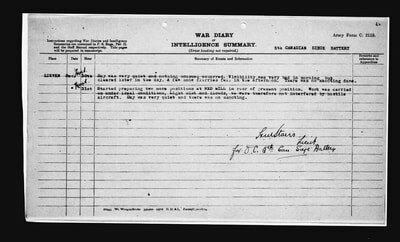 Dec 18th - Lieut D. J. Maxwell and Lieut F. R. May proceeded to Lieven to look over new position. 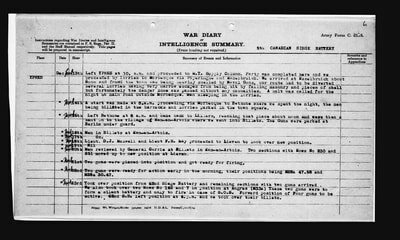 Dec 20th - Men reviewed by General Currie at Billets in Ham-en-Artois. Two sections with Hows No 230 and 251 moved up to new position at Lieven. Dec 21st - Two guns were placed into position and got ready for firing. Dec 22nd - Two guns were ready for action early in the morning, their positions being M25a 47.58 and M28a 30.47. Dec 23rd - Took over position from 62nd Siege Battery and remaining sections with two guns arrived. We also took over two Hows No 162 and 7 in position at Angres (M33a). These two guns were to form a silent battery and only to fire in case of S.O.S. Forward position of Four guns to be active. 62nd S.B. left position at 6p.m. and we took over their billets. Dec 25th - All guns ready for action. Fired 1 shot from How No 251 for registration. Shell exploded in Barrel throwing Gun forward on to the earth box and splitting carriage. No one was hurt, but gun was completely out of action and later condemned by I.O.M. and w\sent back to base. Dec 26th - Plane called at 2.30p.m. to observe for us on Hostile Battery (Z1) shoot was very successful, the pilot reporting 2 O.K’s,4Y’s, 7Z’s, and 2 A’s. 75 Rounds in all being fired. During this shoot the enemy ranged on us with woolley Bears by aeroplane observation and at 4.40p.m. commenced a destructive shoot on our position with 5.9” H.E. Shells were falling at the rate of 14 per minute and 259 Rounds in all were dropped into the Battery position. How No 230 was struck by a shell and put out of action. Ten Men were wounded in the cookhouse whilst lining up for supper. The shelling continued until 5.40p.m. and then ceased and the casualties were then hurried to the dressing station, one man later returning to duty. Dec 27th - How No 251 was pulled out ready for removal. The I.O.M instructed Barrel to be sent to Woolwich and carriage to Base. There was no shooting today and no hostile shelling. 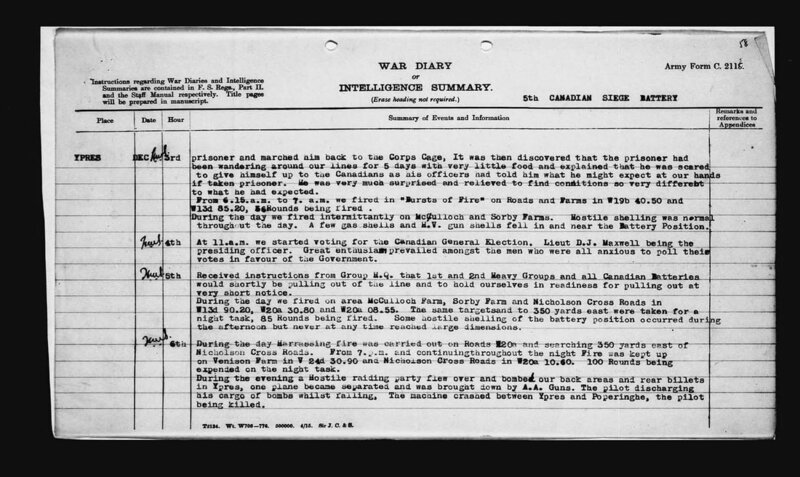 Lieut R. L. Smith proceeded to 11th Brigade to act as Liaison Officer. Dec 28th - Morning was very misty with occasional snow flurries and very bad visibility but cleared up for a short time in the afternoon. At 3p.m. we fired 14 Rounds on a snipers post in a building near Fosse St Louis in M20c 30.90 This was observed by Lieut F. R. May and was successful. 2 O.K’s being registered. Dec 29th - A shoot by aeroplane was started at 9.25 am on Hostile Battery NX 59 in N18b 30.50. This was a very difficult target, being partly concealed by clumps of trees. Visibility was very poor and shoot unsuccessful. 38 Rounds were fired and plane gave C.I. at 11.30 am. During this shoot we were ordered by group to concentrate on Trench Mortars in Railway Embankment in N34c. Plane was given M.Q. and 10 rounds rapid fired at the T.M’s after which we resumed shoot with plane. At 2 P.m. we fired 10 Rounds rapid in Cemetery at N33b, without observation and at 3 p.m. 10 Rounds on M33d 90.90 also without observation. How No 251 was removed to Railhead during the night. Gas alarm was given at 12 Midnight and all precautions immediately taken but no gas came over position. Dec 30th - Day was very quiet and nothing unusual occurred. Visibility was very bad in morning, but cleared later in the day. A few snow flurries fell in the afternoon. There was no shooting done. Dec 31st - Started preparing two more positions at RED MILL in rear of present position. Work was carried on under ideal conditions. Light mist and clouds, we were therefore not interfered by hostile aircraft. Day was very quiet and there was no shooting.